This weeks theme over at I ♥ Faces is Bubbles! I was so excited for this theme, I knew exactly what photo I wanted to showcase! Be sure to hop over to I ♥ Faces and check out all of the other faces and bubbles. This photo is of Tucker. For those new readers to Izzy 'N Emmy, Tucker is currently on week 9 residing with he and his family in Boston Children's Hospital. In June, Tucker and his family flew far away from home to be in Boston for a new and life changing heart surgery. Tucker received a Whole Heart Repair. We ♥ Tucker so very much and cannot wait until he is home soon. This photo is one I took of Tucker at a photo shoot just days before he and his family left for Boston. I like to title this photo, "The Thought Bubble". Enjoy! too cute! Love the colors and his expression! my 50mm works with the d60 but it doesn't auto focus. The same lens in the 50mm that works with the D60 is like $450.00.... YIKES! This one was only $129.00 which was why I just upgraded my camera! 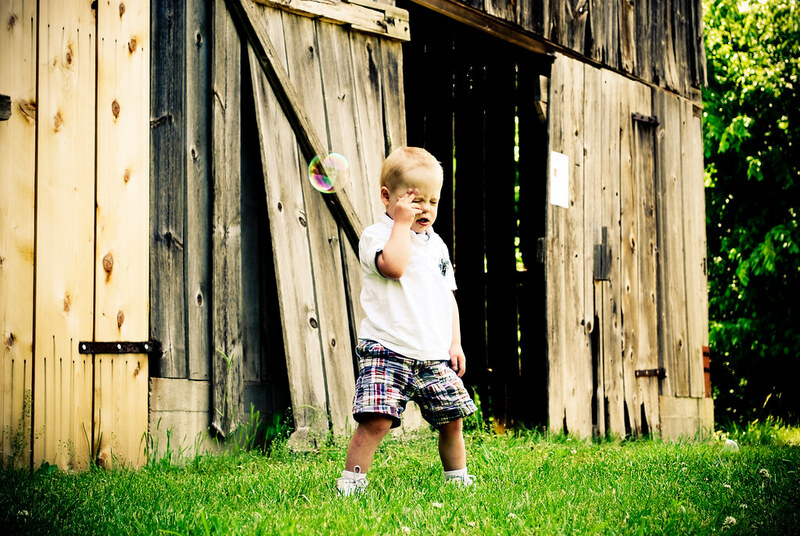 Awe, it does look like he just thought that bubble right out! What a wonderful shot! Aww!!! I really like this one! Cute little guy. Love the title, love the bubble, love the boy! It is a great portrait Alisha! Tucker is precious! Love the bubble! That is THE perfect title to this great photo! Wonderful! His expression is so priceless. Great shot! Love the title! That's great!! It's like he's thinking, "I can resist! I won't pop the bubble. I can resist!" So sweet! ohhhh! Thank you for the laugh! That is adorable! Love your blog - Love your shot! How sweet, that bubble is perfectly placed isn't it! Thanks for sharing Tucker's story, he's such a little guy to be going through such a challenge. My heart goes out to him! Ahhhh! That is the BEST face!! Oh my goodness. Tucker is an absolutely beautiful little boy. I am so thankful that he could have this surgery! I am praying for him as I type! And jotting his name down to remember in the days ahead. God bless you little Tucker! ok, i LOVE this picture! he looks like he's thinking real hard, so so cute! Bless him, I hope he is home and healed soon! Oh what a perfect title. He looks like it hurts to think! my little one just said - 'that little boy didn't pop that bubble he was scared' - cute! So funny. I have no idea what he's thinking but I like that I don't know. Great shot! Great picture! I really like the expression on his face. I love his expression. He DOES look like his concentrating! That's great! How cute, I love his expression! I love this...thanks for the giggle!